As an alternative to nearbys, futures price data can be merged into continual time series as constant-maturity futures prices. 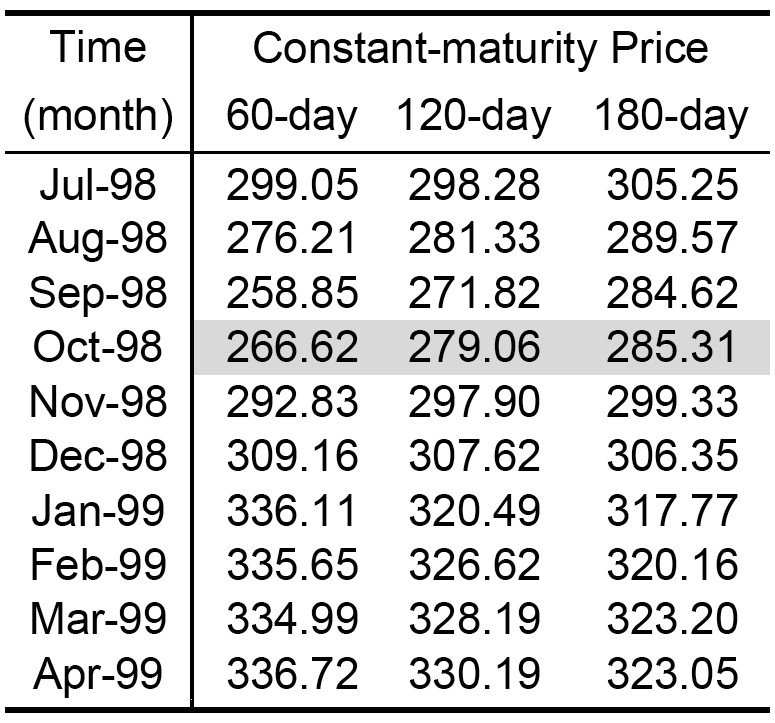 A constant-maturity price series indicates, for each time t, an interpolated price reflecting a specific time-to-expiration that is constant over time. To illustrate, let’s construct monthly 60-day, 120-day, and 180-day constant-maturity futures prices from the CME random-length lumber futures prices of Exhibit 6.9. 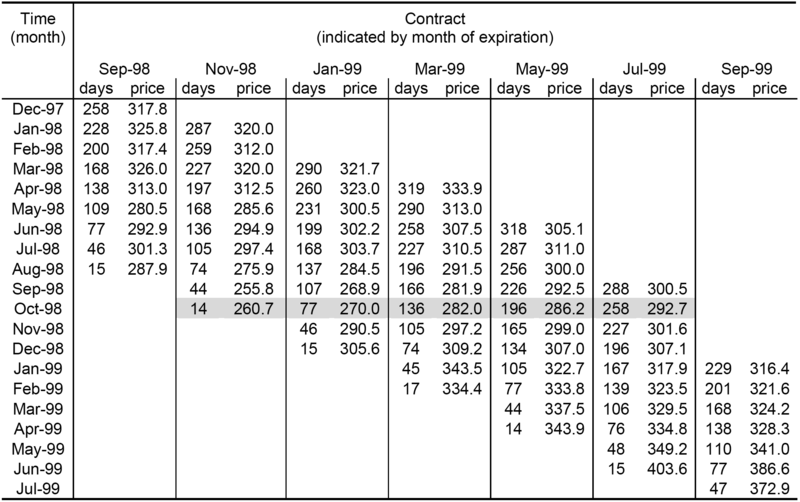 Data for contracts maturing between September 1998 and November 1999 are indicated. Prices are USD settlement prices for the last trading day of each month. The corresponding number of days to expiration is indicated for each contract at each time t.
Exhibit 6.9: Monthly prices and days-to-expiration for random length lumber futures traded on the CME. Prices are quoted in USD and represent the last settlement price for each month. Source: CME. Interpolation is performed with a cubic spline. Exhibit 6.10 illustrates the interpolation for the data of October 1998, which is shaded in Exhibit 6.9. Performing such an interpolation for each month yields the constant-maturity price series of Exhibit 6.11. Exhibit 6.10: The interpolation of constant-maturity prices is illustrated. Random length lumber futures prices for October 1998 (shaded in Exhibit 6.9) are used to interpolate 60-day, 120-day, and 180-day constant-maturity prices. Interpolation is performed with a cubic spline. Exhibit 6.11: Using the data of Exhibit 6.9, 60-day, 120-day, and 180-day constant-maturity random-length lumber prices are interpolated using cubic splines. Results are shown for July 1998 through April 1999. Constant-maturity futures prices are appealing because they don’t exhibit some of the cyclical distortions of nearbys, but they have other limitations. One is the fact that forward contracts are typically quoted as spreads to specific “benchmark” futures contracts. This is done in oil, natural gas, coffee, cocoa, and other markets. For this reason, it is desirable to model the actual futures prices that are used as benchmarks. Converting data to a constant-maturity form is a step in the wrong direction. Another problem is the availability of futures prices from which to interpolate constant-maturity prices. Active futures markets, such as the Eurodollar or Henry Hub natural gas markets, have numerous contracts trading simultaneously. Less active markets may offer just a handful of maturities—perhaps three, or sometimes only two. 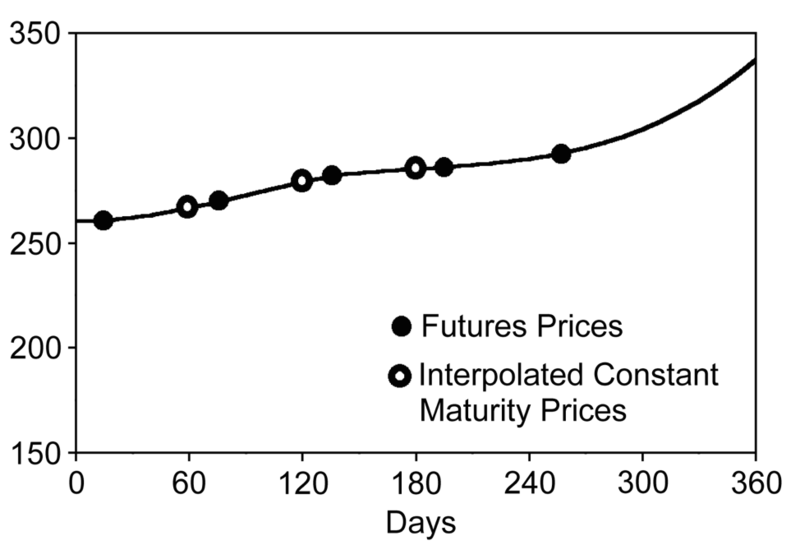 Futures curves may have irregular shapes. Supply and demand issues as well as seasonality effects cause them to rise and fall with irregular patterns. Trying to interpolate constant-maturity prices based upon two or three contracts is likely to be a unsettling experience! The most useful application of constant-maturity futures prices is as a proxy for forward prices. As long as enough futures maturities are traded to facilitate reasonable interpolation, and there is no significant convexity bias, such use may be reasonable. For most purposes, nearbys are a better alternative.